There were three separate attacks on Israeli vehicles in Judea and Samaria on Wednesday; and another in Jerusalem. There were three incidents of stones being hurled at vehicles in Binyamin and Gush Etzion in Judea on Wednesday. Close to the village of El Aroub, located southwest of Bethlehem on the Hevron-Bethlehem highway, Arabs threw stones at an Israeli bus. No one was injured, but the bus was damaged. In Tatzpit, only a few minutes later, it was reported a group of Arabs hurled stones at another Israeli bus. No one was injured, but the bus was damaged. Later, a group of Arabs stoned several vehicles near the village of Deir Abu Mashal, which is close to the Binyamin Junction. Vehicles were damaged and one woman was treated for shock. In all three incidents, the IDF deployed forces to search for the instigators. In Jerusalem, a fourth incident occurred in the mixed Arab-Jewish Abu Tor neighborhood. A bus carrying children aged from 3 to 13 was set upon by local Arabs who smashed the vehicle with cinderblocks. The Arab bus driver hit the gas and sped away to clear the area. No one was injured, but the bus was damaged. Such attacks have proven fatal in the past. 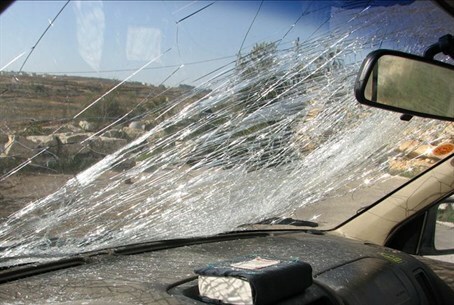 On 23 September 2011, Arabs near Hevron hurled a large stone through the windshield of Asher Palmer, 25. The stone smashed through the windshield, striking Palmer in the head and causing him to lose control of his vehicle. Both Palmer and his infant son, Yonatan, were killed when the car went off the road and down an embankment. Regional activists say, "In the past two weeks there have been almost daily incidents of stone throwing at Israeli vehicles in at least one of these locations. This should be noted by officials. There was once a military checkpoint there that was staffed regularly, but it was removed a year and a half ago."